NYMEX WTI steadies after catching new 2019 high near $60.40. The euro is under heavy selling pressure this morning after PMI data revealed that economic growth is stalling. Private sector business activity slowed down significantly in France, and the Manufacturing Output Index is at a 3-month low. Ongoing protests are also not helping to inject confidence among the business community. Germany is experiencing a similar slowdown. The Flash PMI plunged to a 69-month low, and softer global demand weighed on the performance of the manufacturing sector which is now at its weakest contraction rate since 2012. The US dollar extends its recovery against the major peers with the DXY Index now hovering near an eight-day high. There are strong buying interests following weaker than expected PMI numbers out of the Eurozone. Improving manufacturing conditions as revealed by the Philly Fed Index yesterday also helped to shrug off dovish comments from the Fed. The gauge for manufacturing activity jumped from a reading of minus 4.1 last month to 13.7 in March. Commodity currencies are trading with a negative bias mirroring soft performance from the oil futures market. WTI is 1.2% down, on profit-taking activities. Crude is retracing after touching a fresh high at $60.40 a barrel. After a busy week, the economic calendar is quite light this Friday. We only have the manufacturing PMI and home sales data coming up today. GBP/USD is trading in a positive territory today after dropping 1.70% yesterday. The EU agreed to postpone Brexit for two weeks, to April 12th. We are, however, doubtful that the Parliament will be able to agree on the same deal that was rejected twice unless of course, the MPs concoct a last minute deal. The PM is hoping to be able to tweak the Withdrawal Plan, failing which a no-deal exit could very well become a reality. The pound is expected to remain volatile as investors look forward to another week of uncertainty due to unfold in the House of Commons. The euro is the weakest performer among the G-10 currencies this morning. EUR/USD plunged 0.6% form the session high after Eurozone PMIS was below market expectations. French business activity contracted, falling below the critical 50 handle to a two-month low at 48.7. New orders declined, and new export recorded its steepest drop in nearly three years. Meanwhile, the German manufacturing downturn continues. PMI was t 44.7, a six-year low. The economy continues to be affected by growing uncertainty over Brexit and US-China trade relations. 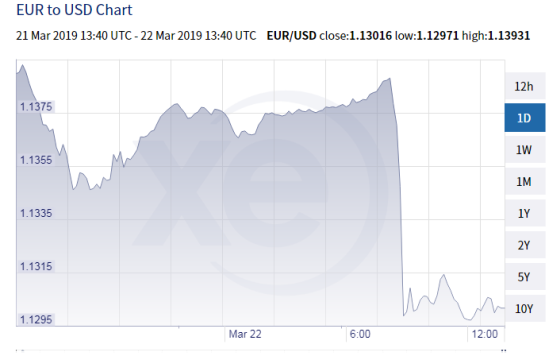 EUR/USD is now trading at its lowest level in seven days, erasing all post-FOMC gains. The Canadian dollar dropped to its lowest level in a week after retail sales decline for the third consecutive month in January. CPI rose 1.5% on a year-over-year basis last month. With the WTI trading lower today and a resurgent greenback, we expect the loonie to trade with a negative bias. The greenback is unable to halt its slide against the Japanese yen, dropping to a five-week low. Safe-haven flows continue to support the JPY as the market is fearing a no-deal Brexit and due to prolonged uncertainty over US-China trade negotiations. The market seems to be ignoring dismal PMI data out of Japan earlier today. Business confidence is still at low levels given weaker growth in neighbouring China.